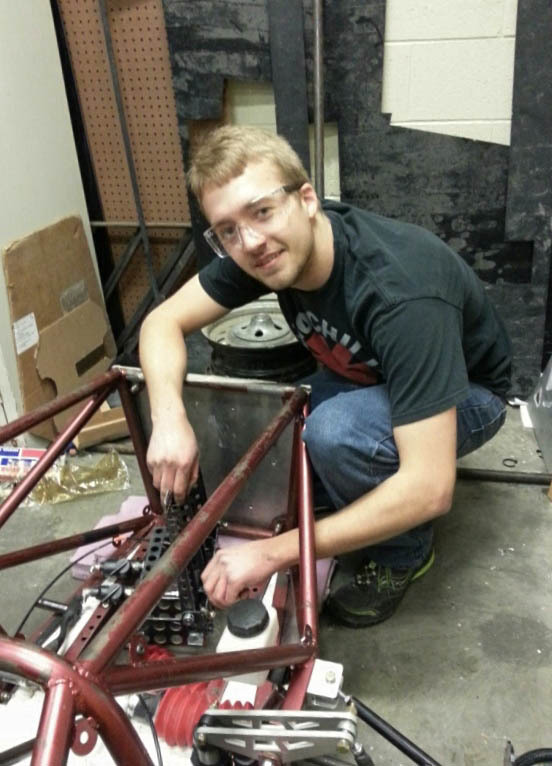 Rensselaer Formula Hybrid Racing: Busy Day At The Shop! Today is shaping up to be one of our most productive days of the semester and it feels great. We've had about 20 members in and out of the shop throughout the day working on various projects and a lot has gotten done. We have an anticipated first drive date of March 2nd, which is just one week away. 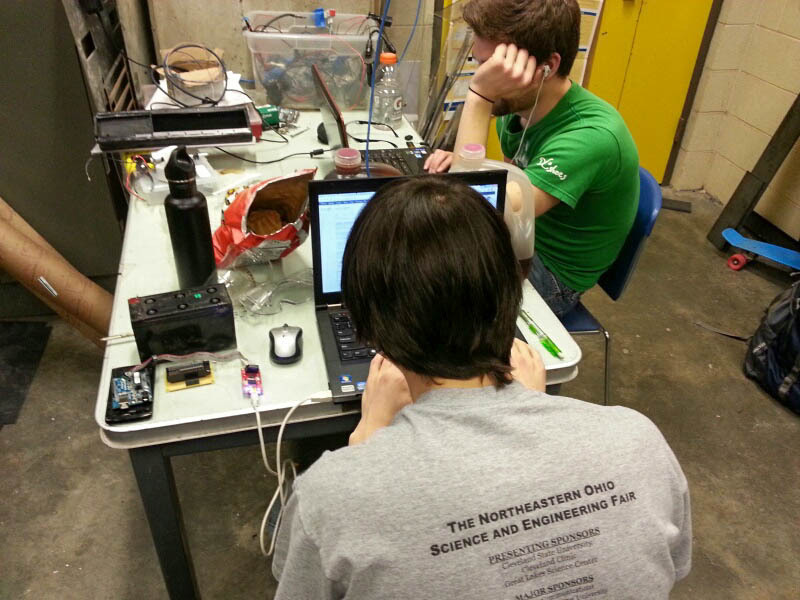 The team has been working vigorously in order to meet its goal. Here are some highlights from the variety of projects that are being welded, chopped, shaped and designed behind the doors of our shop. 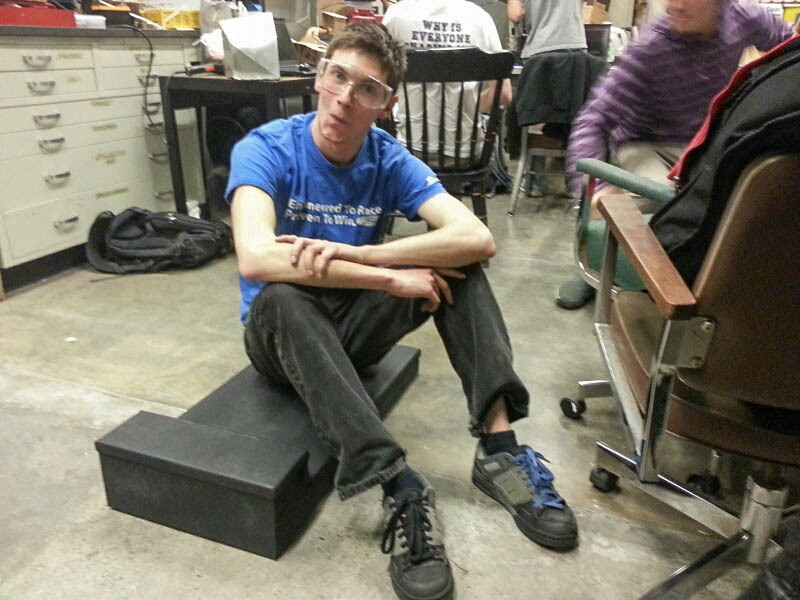 In this next photo, you'll see senior Dave Golden putting the final touches on his pedal box. 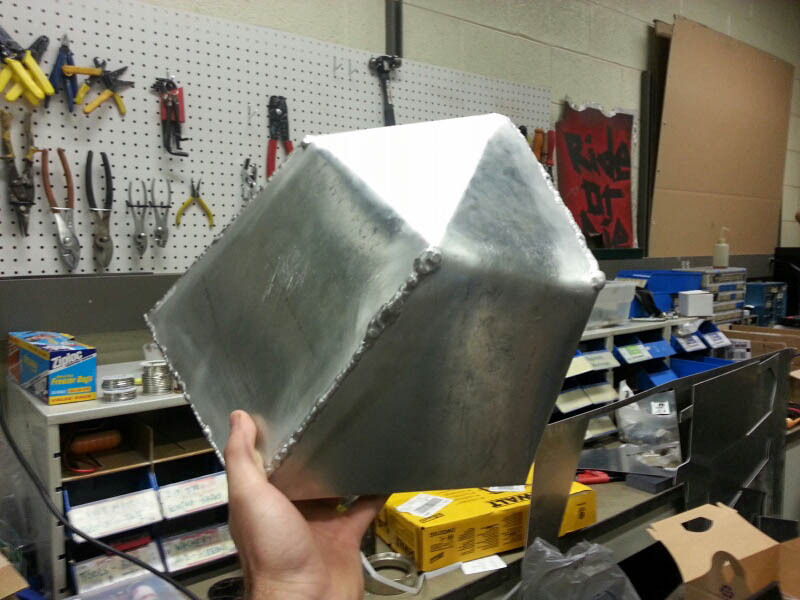 Designed in Solidworks and crafted from steel, this year's box will be extremely light, coming in at around 5lbs. and considerably stronger than previous iterations. 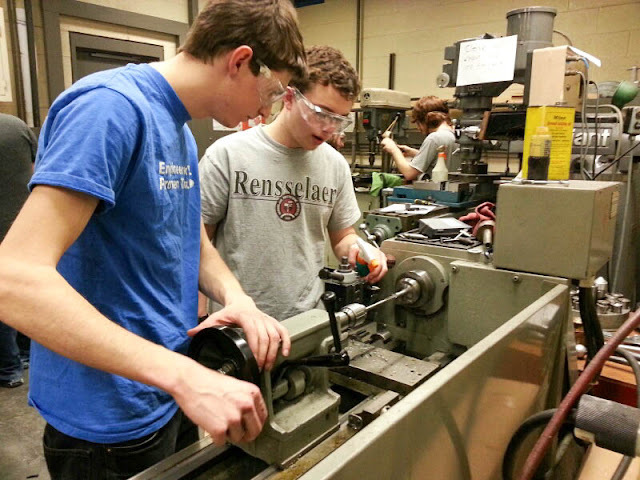 Here you'll see president Sam Putney working with Freshman Kyle Pollard as they make inserts out of aluminum on our shop lathe. 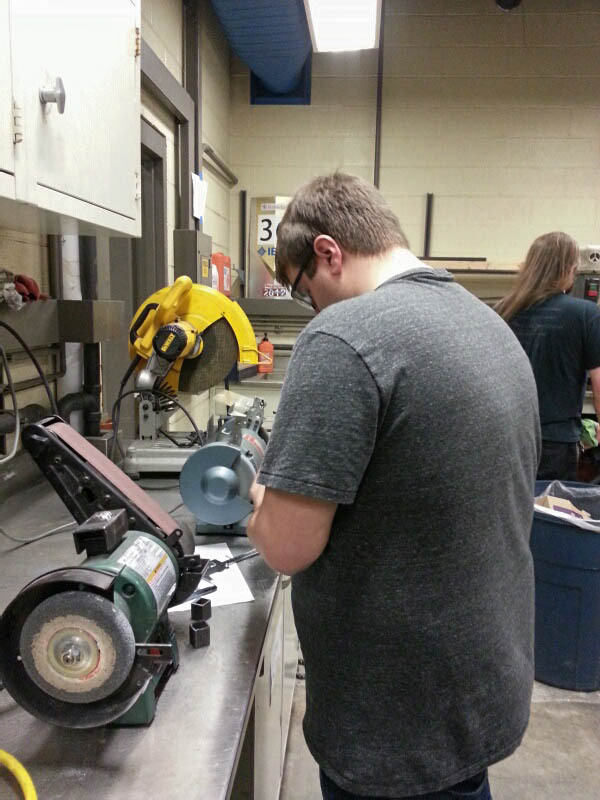 Here, freshman Larry Oligny is making some fine adjustments with the bench grinder. One project that we are particularly excited to make progress on is our drivers seat. 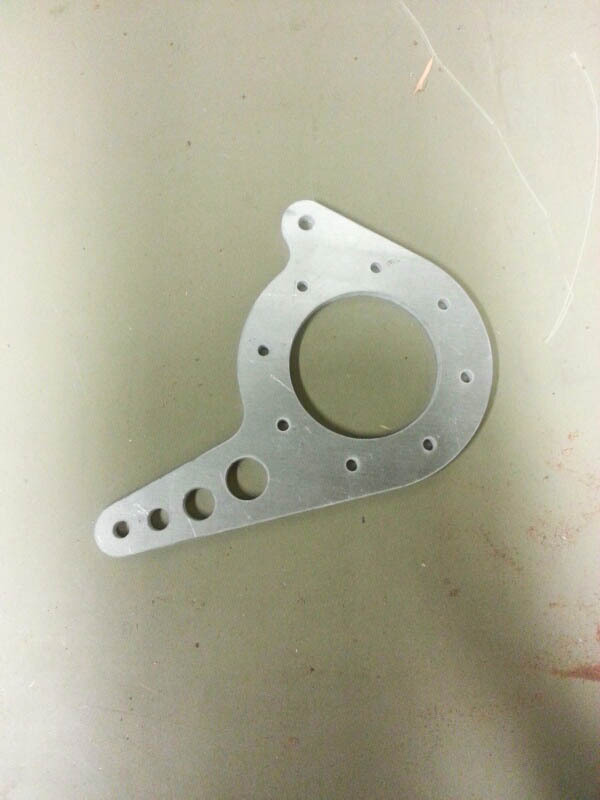 Here you can see our lightweight aluminum seat pan which had been cut and bent in-house. 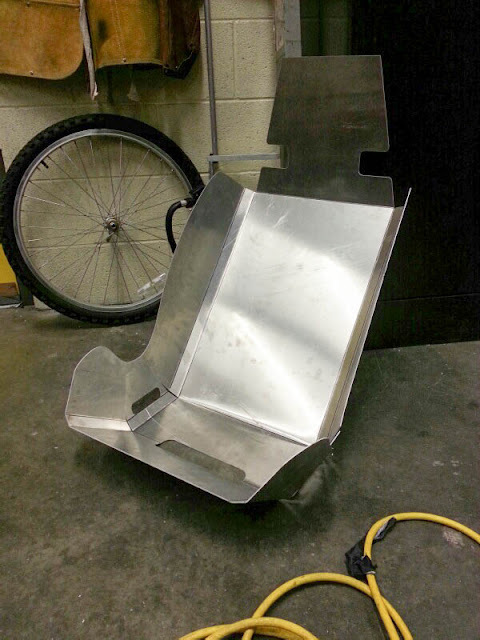 Soon its joints will be welded and we'll send it over to a local business called Ecovative Design who has graciously offered to construct our seat-support material from their patented fungus-based foam material. 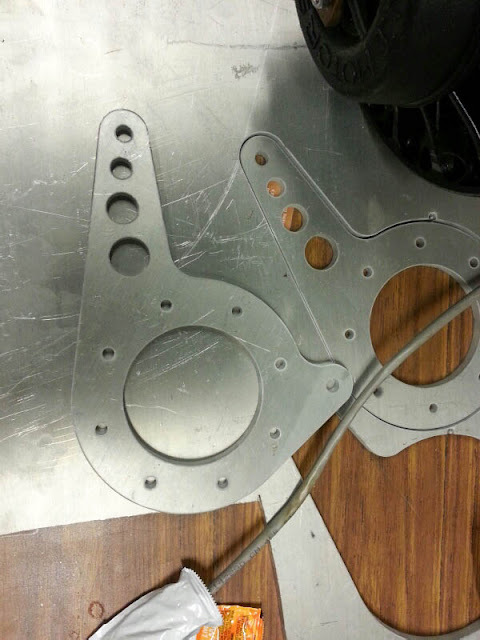 In these next two photos, you'll see our differential hangers which were designed by vice president Liam Mooney and cut in-house from aluminum. This year we will be running a limited slip differential which is currently being built for us by an outside vender. 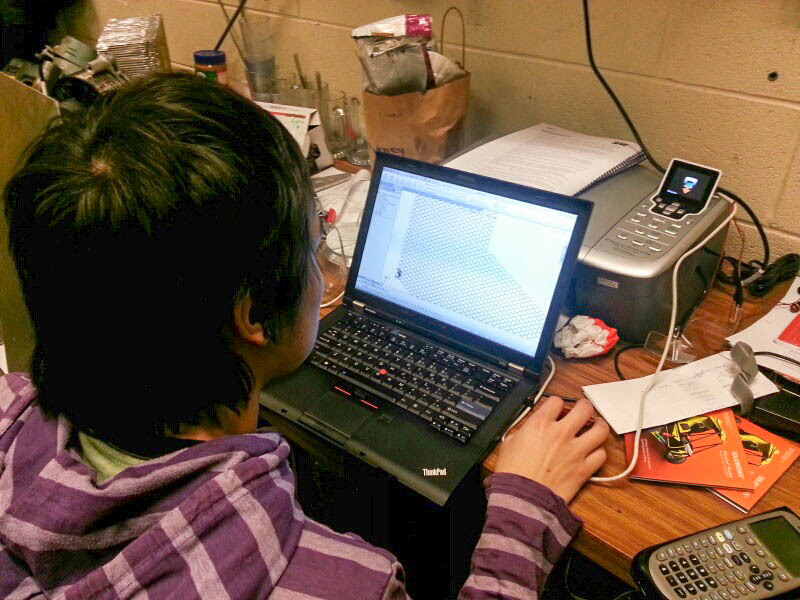 Following the two photos of the diff hangars, you'll see VP Liam himself working with our impact attenuator material on the CAD software, Solidworks. An exciting delivery that we got in the mail this week is a soda-can sized turbocharger from Garrett Turbochargers. 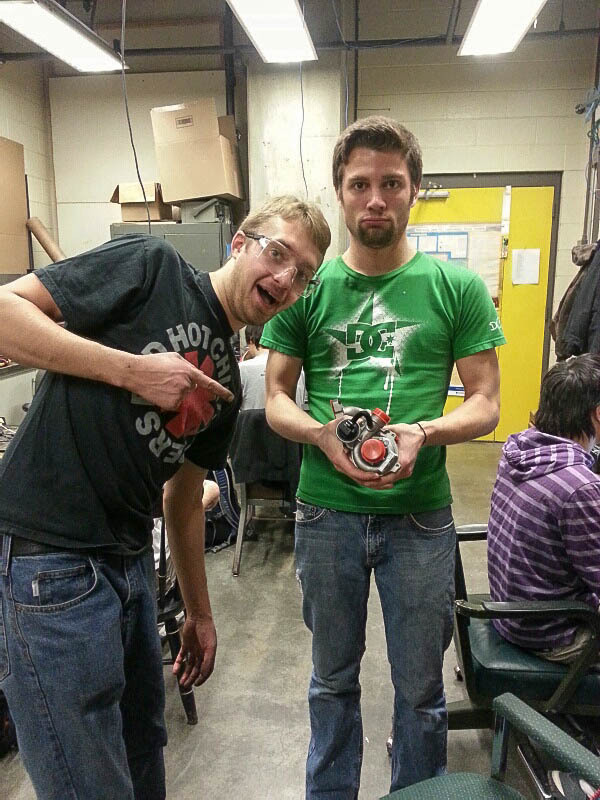 Senior Dresdan Gordon (in green) has been spearheading the forced induction project on the team and has done hours of calculations to prove the benefits of the tiny turbocharger. The next challenge for Dresdan will be fitting the turbo and building the intake restrictor which is mandatory for forced induction vehicles in the Formula Hybrid competition. 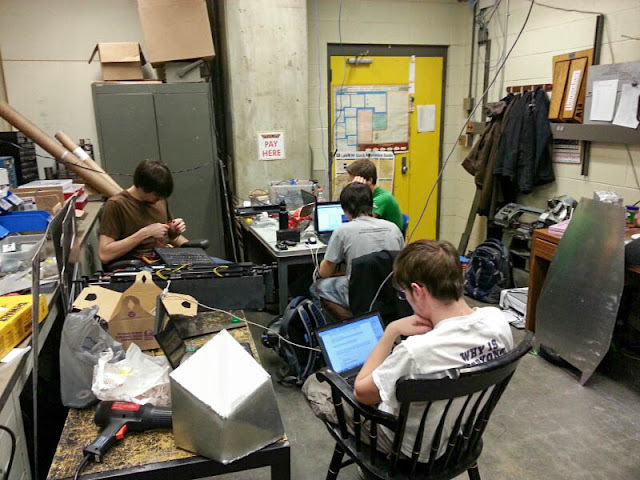 The electrical team, led by junior Caleb Cook-Kollars, (in brown) has been working furiously to make headway on the car's CAN BUS communication system. 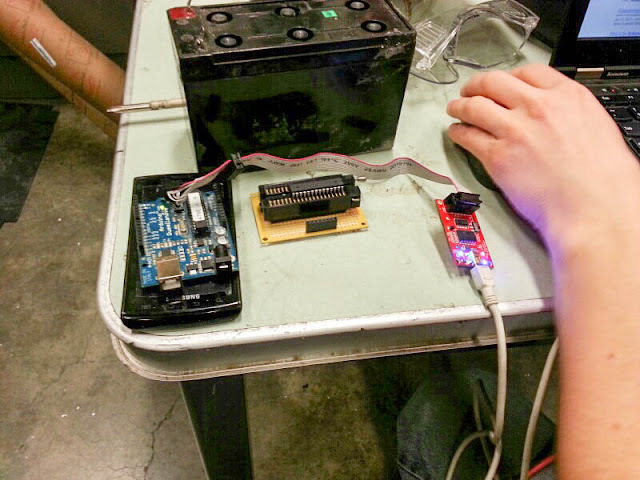 The CAN system is made up of a network of small chips which will be placed throughout the car. The chips have the ability to perform functions and collect data from their respective areas. The network, which will act like a nervous system for our car, will allow for wireless, real-time, data acquisition. 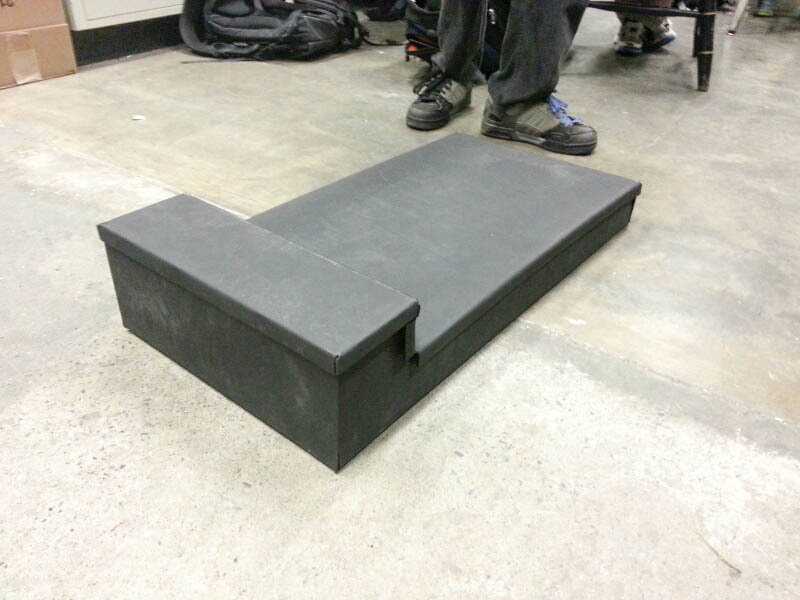 This will prove to be an invaluable asset during the testing and tuning of our car. Our all-aluminum fuel tank is finally completely bent and welded together. 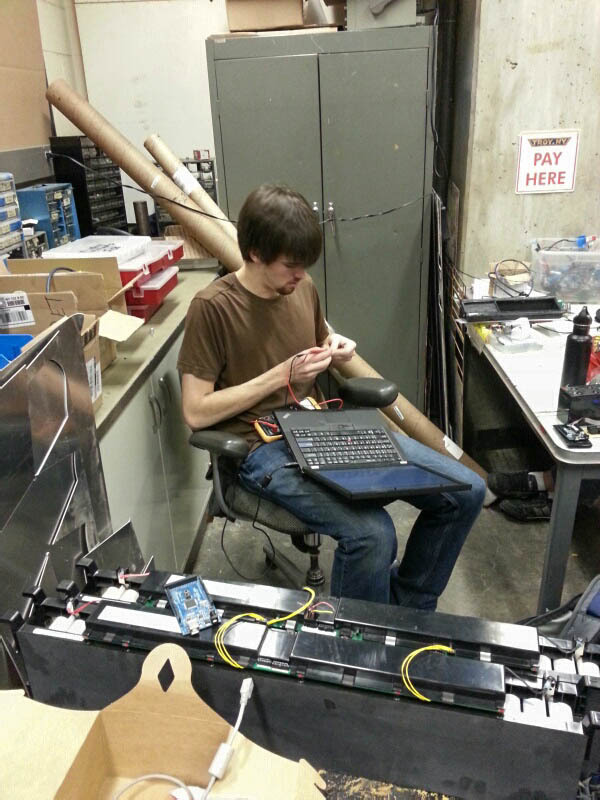 Finally, one last-minute change that we had to make in order to comply with this year's competition rules is in our battery placement. In previous iterations of our car, we carried our batteries in an aluminum box on the side of the car. 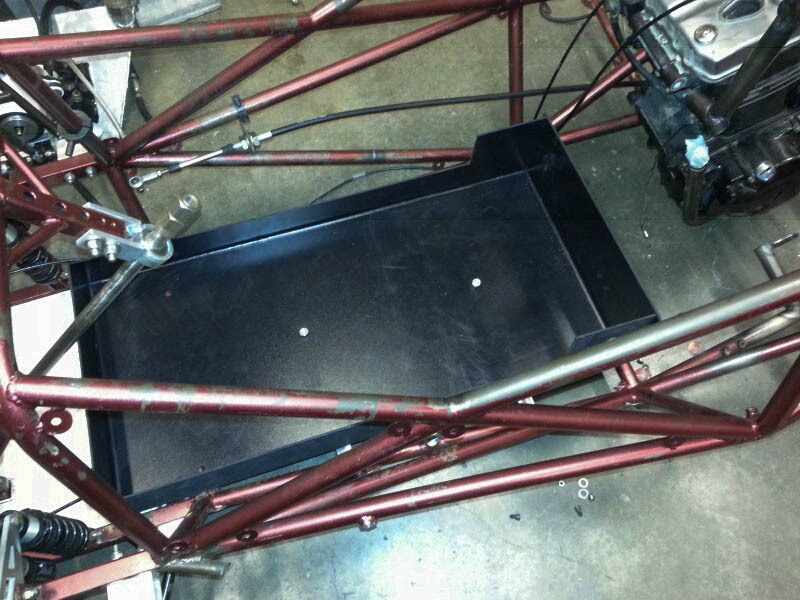 In-fact, our chassis was originally designed with this configuration in mind. However, this year's rule book stipulates that the batteries must exist within the structural frame of the car, so we decided to move the batteries from the side of the car to beneath the driver. 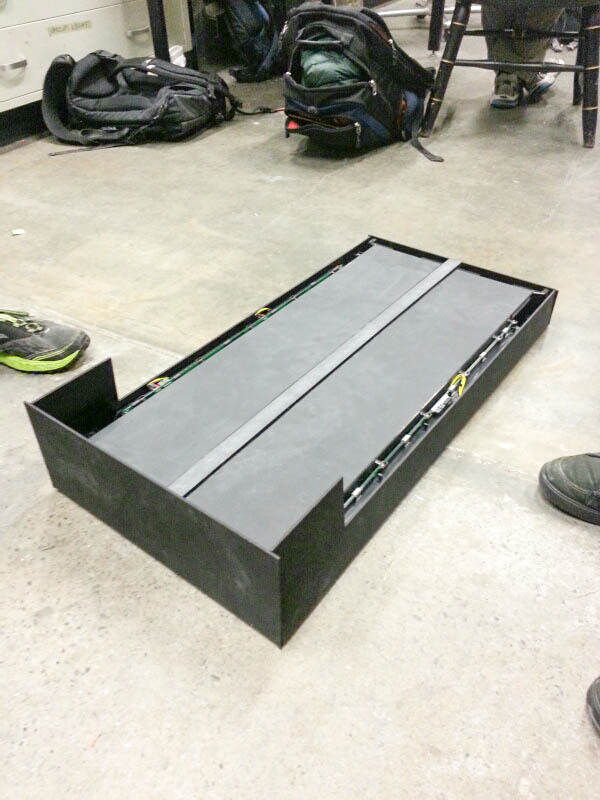 In the next four photos, you'll see our battery box, which was built by president Sam Putney out of a durable plastic material called kydex. Thanks for checking in and be sure to look for our weekly updates.